The Motley Fool Canada » Dividend Stocks » Which Dividend Stock Is Better for a Turnaround Now? Which Dividend Stock Is Better for a Turnaround Now? The stocks of Birchcliff Energy (TSX:BIR) and AltaGas (TSX:ALA) have underperformed the long-term average market returns of 10% in the last year. Which is better for a turnaround investment right now? Birchcliff remains profitable in a difficult operating environment Looking at Birchcliff’s long-term price chart, we can see that it’s a cyclical stock. At the peaks of cycles, it reached the $14-15 per share range in the past. In the 2016 peak, it climbed to the $9-per-share range. BIR data by YCharts. Birchcliff’s long-term price chart. The stocks of Birchcliff Energy (TSX:BIR) and AltaGas (TSX:ALA) have underperformed the long-term average market returns of 10% in the last year. Which is better for a turnaround investment right now? Looking at Birchcliff’s long-term price chart, we can see that it’s a cyclical stock. At the peaks of cycles, it reached the $14-15 per share range in the past. In the 2016 peak, it climbed to the $9-per-share range. In the last four reported quarters, Birchcliff generated more than $321 million of operating cash flow. Even after subtracting the capital spending in the period, it still had $21 million of free cash flow. Despite low natural gas prices, Birchcliff remained profitable with a recent net margin of 9.5%. This year, the company is focused on generating free funds flow. It also estimates capital spending of $210 million, which is 30% less than last year, but expects production levels to match last year’s average production of 76,000-78,000 barrels of oil equivalent per day. Birchcliff is trading at a super-cheap price-to-cash-flow multiple of about 2.9 at $3.50 per share, which is obviously at the low end of a cycle. Since its normal multiple is about 7.7, it can trade at about $9 per share under normal market conditions. That would imply an upside potential of about 157%. In the next 12-24 months, it’s more likely that Birchcliff will trade at $4-6 per share. 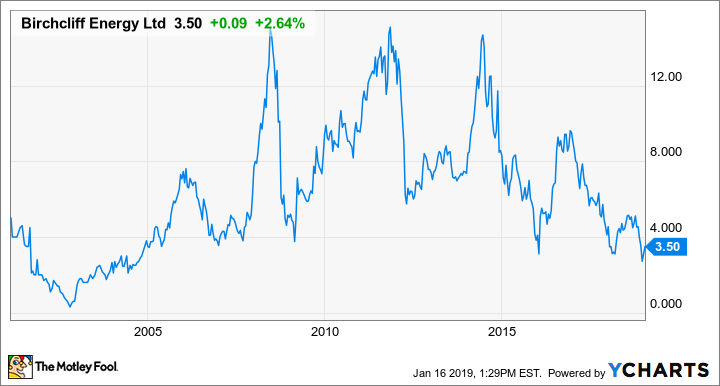 The analysts from Thomson Reuters has a mean 12-month target of $5.73 per share on Birchcliff, which represents almost 64% near-term upside potential on the stock. AltaGas has underperformed for a number of years. Last month, Randall Crawford was appointed as CEO, which, hopefully, will steer the ship in the right direction. First, the dividend was slashed by 56%. This will help allocate capital for other uses with the top priorities being to reduce debt and increase financial flexibility. AltaGas aims to maintain investment-grade credit ratings, and the de-leveraging process can take several years. Second, AltaGas has a number of projects to grow the business. For example, the Ridley Island Propane Export Terminal is expected to be in service this quarter to export up to 40,000 of barrels per day. Ridley will be a big help to western Canadian producers, as Ridley connects them to premium Asian markets. The expansion of the Townsend gas-processing facility is expected to go online in the fourth quarter. Third, its utility assets in the U.S. are expected to have strong organic growth. Their returns on equity are 9.25-12.55%. AltaGas is a “show me” turnaround story right now. Over the next year or two, AltaGas needs to execute and show that it can create shareholder value with prudent capital allocation. The analysts from Reuters has a mean 12-month target of $19.20 per share on AltaGas, which represents almost 39% near-term upside potential on the stock. Currently, Birchcliff seems to be a better turnaround investment, as it’s at the low end of a cycle. Its dividend also looks safer given it has cash flow coverage, and the company has a decent balance sheet. It’d be prudent to wait for confirmation of execution in AltaGas before investing in it for a turnaround. Fool contributor Kay Ng owns shares of ALTAGAS LTD. and BIRCHCLIFF ENERGY LTD. AltaGas is a recommendation of Stock Advisor Canada.